How Does ESSA Support School Climate? We can all think back to a moment in time during our K-12 schooling when we felt safe or unsafe, and respected and encouraged (or not) by an adult. We can think of the friends and peers we had that might have grown up in difficult houses, and how they were affected academically, socially, and emotionally. We can think of that one kid in our class that without fail, was constantly picked-on or the kid that seemed to have it all together: academically and socially. We can also remember what it felt like going to school every day. These images and experiences – whether good or bad – stick with us for life. These same experiences often shape our development, perceptions, education, reasoning, critical problem-solving skills, future goals, and more, as we go through school and life. As teachers, administrators, counselors, and really any adult working in a school, we witness, through our adult “lenses,” even more jarring situations that can disrupt a student’s learning and social, emotional, and physical safety. This may extend into impacting parents/guardians and the community as a whole. And, as teachers, we also see how a school’s climate can affect our own personal relationships, teaching, and overall well-being. A positive school climate plays a huge role in establishing productivity, efficiency, effectiveness, collaboration, and positive academic outcomes within a school. The National School Climate Center (NSCC) defines school climate as the quality and character of school life. School climate is based on patterns of students', parents' and school personnel's experience of school life; it also reflects norms, goals, values, interpersonal relationships, teaching and learning practices, and organizational structures. Each person contributes to the operations of the school and the care of the physical environment"
A 2004 study resulted in a correlation between teacher-student relationships (a facet of school climate) and student academic achievement. A 2011 study resulted in finding “when disadvantaged students reported a positive school climate, school grades were more aligned with peers from higher-income families (Reynolds, K. J., Lee, E., Turner, I., Bromhead, D., & Subasic, E. (2017))." A 2015 study (similar to 2011) resulted in finding a correlation between positive school climate (regardless of family structure) and academic achievement. Obviously, school climate is not limited to just the impact it has on student academic achievement. School Climate Surveys - Can School Climate Be Measured? Let’s face it. There isn’t an adult in the world who works with students that don’t recognize the need to promote a healthy school environment. We want our students to feel safe and supported. It speaks to the very core of who are and why we do what we do. And because teachers are an integral part of a student’s success, our well-being is important too! After years under NCLB’s “test” push, that included a narrowed academic and accountability focus, we can finally start to shift our attention once again back to the whole learner and a well-rounded curriculum, that supports a strong Social Emotional Learning (SEL) integration under ESSA. 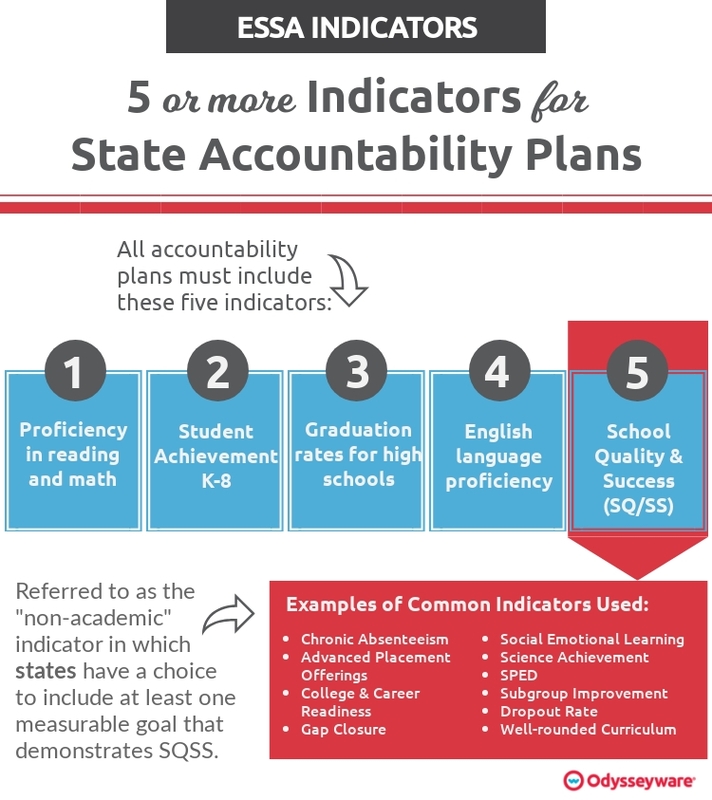 ESSA required states to submit their State ESSA Accountability Plan that outlined what they would be measuring under each of the five required indicators, to ensure – and prove – student success. Often referred to as the “non-academic” Indicator, the fifth Indicator of ESSA is School Quality / Student Success (SQSS). This Indicator is more flexible when it comes to school choice to provide measurable outcomes. Schools can choose from a number of different topics to measure. While states don’t always call out SEL as an indicator, SEL concepts are tied into measurements of other indicators used to support the whole learner, including school climate surveys, chronic absenteeism, and college and career readiness. Further, a growing number of states, districts, and schools are promoting SEL initiatives beyond their ESSA’s plans. As districts work to drive positive, measurable outcomes from their stated ESSA Plans, schools are looking for ways to support these initiatives through curriculum, supplemental resources, and even staff expansion. This is especially true for schools looking to support students and community in Social Emotional Learning (SEL) and seeking out solutions to improve their school climate and performance. California, for example, has been identified as a “leader” in incorporating school climate as part of its school performance. According to CASEL’s State Scorecard Scan, “The past seven years have witnessed tremendous growth in the number of states adopting social and emotional learning (SEL) competencies/standards and guidance to support the implementation of SEL.” Fourteen states have already put SEL competencies/standards in place – and this push is not slowing down amongst other states. There are numerous paper and pencil options out there that claim they are the best option for identifying social-emotional, problematic indicators. However, is paper and pencil the most engaging environment for students to work in – and allow students to open up easily? What about struggling readers or ELL students? Will they be able to understand the vocabulary being used and be engaged long enough to write out their true feelings? Is paper and pencil the most efficient way to determine the challenges faced by students to initiate meaningful conversations? And the ‘heaviest’ question of all: What happens when a student writes something down that needs attention immediately – and the teacher doesn’t see it until much later? So how can schools provide a safe, healthy and productive environment for their students? This is a challenging question that many schools face. A solution lies in BASE Education. A revolutionary, online, Social Emotional Learning (SEL) program that truly helps schools and students to recognize the challenges and educated to the needs of the whole learner. Our digital native students are used to ‘talking’ through different modalities, and this is why giving them a platform to communicate their feelings, fears, and peer/social problems through an online medium is the key to identifying problematic indicators before it becomes too late. This means that schools can now effectively reach students in both intervention and prevention models. Positive Behavioral Interventions & Supports (PBIS). Learn how this revolutionary, digital curriculum is helping students navigate some of life's most challenging topics. Watch the BASE Education Overview Video! Watch the BASE Education Overview video and see for yourself just how powerful this new addition will be for SEL initiatives in all schools! Learn what research tells us about SEL and the efficacy of such programs. ESSA calls for a holistic view of education and shifts away from the sole focus on academics. In this view, ESSA provides an opportunity for districts and schools to focus on and fund SEL programs. As an SEL program, BASE Education qualifies for multiple funding sources and is aligned with ESSA. Odysseyware is committed to helping schools and districts achieve SEL and academic achievement success in conjunction with their ESSA goals. Therefore, we invite you to engage with an Odysseyware expert today to learn more about our offerings and how they are helping schools and districts across the nation stay in adherence to their state plans while providing SEL and high student achievement success!